Daniela Cascella, Singed: Muted voice-transmissions, after the fire, Equus Press, 2017. Singed carries further what Cascella began in her previous two books, En Abîme: Listening, Reading, Writing (Zero, 2012) and F.M.R.L. : Footnotes, Mirages, Refrains and Leftovers of Writing Sound (Zero, 2015). In the former, she explored listening and reading as memory-based activities both creative and critical; the latter’s “deranged essays” operated across sonic patterns, assonance, repetitions, and complemented reading with voicing. A synthesis of the two projects, Singed performs a transmission of knowledge in a condition of instability across languages, media and cultures. The text attempts a multilingual type of writing, not “in translation,” but in “trance-lation”: between languages, ceaselessly trancelating words, rhythms and silences in a state of otherness in motion. In Singed, Cascella presents memory as sonically associative (“Will the song’s murmur muster a mourning?”), meditating on how to undertake writing vis-à-vis silence. Daniela Cascella, F.M.R.L. : Footnotes, Mirages, Refrains and Leftovers of Writing Sound, Zero Books, 2015. Listening into writing, reading into writing take shape in F.M.R.L. through a collection of short texts, fragments and 'deranged essays', with attention to pacing and linguistic derives. An archive of books, notebooks, events and records prompts the texts in these pages, responding to encounters with Michel Leiris's autobiographical fictions; concerts and events at Cafe Oto and the Swedenborg House in London; visits to museums such as the Pitt Rivers in Oxford and exhibitions such as Ice Age Art at the British Museum, among the others. F.M.R.L. is a book constructed across sonic patterns, assonance, repetitions, comprising texts that intermittently drift from sense to sound and to nonsense and back. A flip from the immateriality of sound to the sounds of letters and words as material, a call from reading to voicing. So here I am musing over the assonance of sequel and cyclical, can I begin by imagining a cyclical sequel, can I write and rewrite this sigh and this song and this listen as a cyclical sequel? In all this I become sequel and cyclical: quizzical […] Every beginning a sequel each beginning a sequel equel quel uel el l (p. 22). This is how I am drawn to sounds. I know nothing of them, they whisper from the edge of my understanding spend time with me now. And then I recall, then I write and the words that follow will not have a punctum, they will trace instead an extended arc of kinships, in various degrees of closeness and distance, opacity and clarity, and the evidence will never be there, and it will always be on an edge, tripped over toward the multiplicity of singular and contingent ways of listening (p. 80). As I sit here trying to write this review, squinting at the words on the screen, I become intensely aware of a forlorn, ignored car alarm flailing away outside, the rustle of wind in the trees, the distant rumble of traffic punctuated by the grind of the bin lorry and the whine of a workman’s saw downstairs. The phone calls and arguments of passers-by, the wind on this breezy morning taking their voices and mutating them into something other. I am listening, and I am writing, and I am reading. Each sound has its own trajectory into memory and into the future, and it seems words, these inadequate marks on paper or screen, are the only way we can hold those vibrations in the air. Blimey. That’s what this book does to you. 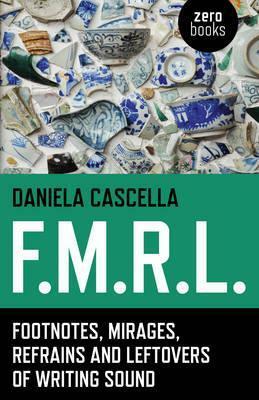 Initially, Daniela Cascella’s F.M.R.L. frustrates and mystifies, revealing little. Yet a book which modestly subtitles itself ‘Footnotes, mirages, refrains and leftovers,’ and whose own author describes it as an “improvisation in writing, listening and reading”, slowly teases out the significance of those four letters in an enterprise which constantly interrupts and echoes itself — much like the processes of remembering and writing which are its focus. Finally, it manages to reveal lots. Like the Akio Suzuki performance Cascella recalls, what may at first seem fragmentary, muddled, recalcitrant and left-field later realises itself as miraculous and fully-formed. Or the Giacinto Scelsi string quartet she describes as “a series of beginnings that curl back onto themselves and begin nothing other than a muted, repeated, flawed and ever-incomplete involvement with sounds” — a canny description of the book itself. Fifteen short chapters begin with a playful dialogue between sound and a writer, as Cascella seems to work out what she’s doing on the page before you, and then moving straight into the tangled yet lyrical description of that Scelsi quartet. As soon as you are oriented to that, Cascella moves again, to the Pitt Rivers Museum in Oxford where a brass amulet triggers a moving memoir of her Neapolitan grandmother casting her final spell. And so it continues. 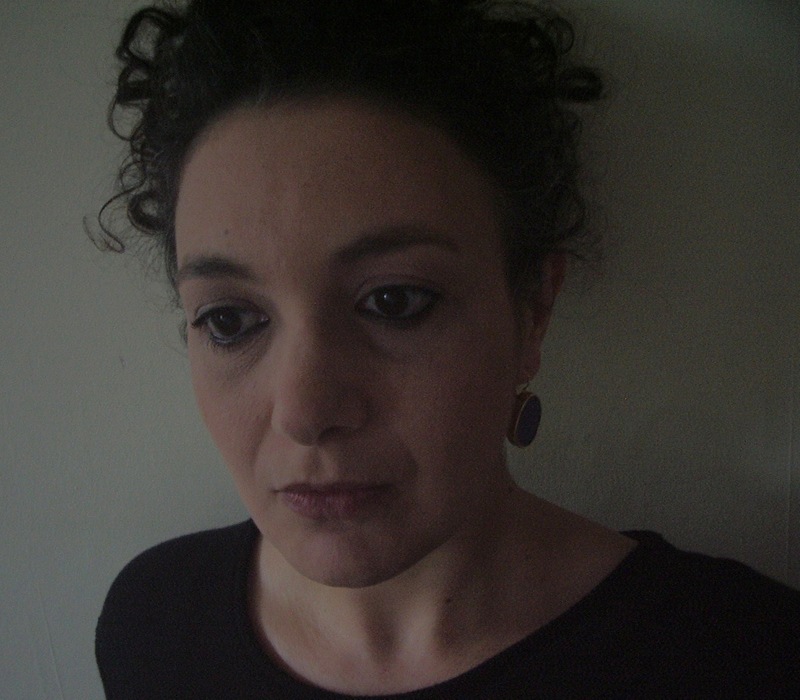 Cascella, an Italian now resident in London, has worked as a curator, lecturer and writer working largely in the field of sound and uses her experience as the mulch of F.M.R.L. Her first book, En Abîme circled similar areas, using personal experience as trigger for reflection in listening, reading and writing. Yet F.M.R.L. takes the approach a step further, defiantly becoming even more fragmentary, picking up on tiny clues and memory traces (those ‘footnotes, mirages, refrains and leftovers’), piecing them together to make a book which is ultimately more successful than its predecessor. Her writing draws on the models she refers to throughout the book (de Filippo, Malaparte, Rhys, Lispector), yet her English has a demotic edge, a journalistic sharpness and no truck with international artspeak. This lends the writing a directness, avoiding the occasional vagaries of her influences, which in turn gives the book another reason for its success: its emotional heft. Added to this, Cascella is a great storyteller. Her process moves toward the abstract, theoretical or intangible from a close engagement with the sensual and with lived experience. A description of a two-hour walk with the artist Paolo Inverni into an underground cave in the Italian Alps (“in total darkness…humidity 100%, temperature 5.5°C”) is Robert Macfarlane-esque, an adventure I’d be tempted to try myself, full well knowing I’d probably never have the balls to do so. On the other hand, her rapt description of walking through Berlin at 6am after seeing “the dawn break from the huge windows at the Panorama Bar in Berghain above bodies and techno bedazzlement and movement and thick air and euphoric thoughts of abandon,” drew me back to my own memories of such times. The stories are not all personal. Moving on from thinking about de Filippo and Malaparte, she goes on to tell the grand guignol story of the Palazzo Sansevero in Naples, home to the Faust-like Enlightenment alchemist Prince Raimondo di Sangro and Carlo Gesualdo, madrigalist and murderer. Folly, madness, recklessness, lunacy. And listening. F.M.R.L. was the longest 120-odd pages I’ve read in ages: it sent me down Wikipedia holes, chasing references, looking through old books, buying new ones, Googling and YouTubing to find or re-find that Scelsi quartet, the Sardinian polyphonic singers Tenores de Bitti, 90s Neapolitan dub act Almamegretta, an obscure Arthur Russell track, or to remind myself of Canto 13 of the Inferno, or Gianni Rodari’s Lamberto Lamberto Lamberto, scrambling to learn more about Michel Leiris or Henri Michaux. Having the ability to find the sounds, places, writers and music referenced in the book opened up the experience of reading immeasurably, turning it into one of listening, too. And yet, the book avoids what is at its centre: there are no gushing descriptions of being rapt by sound, no blog-standard music crit thinkpieces. Cascella instead reveals the ghosts that the haptic experience of listening arises from, the gain and loss of their translation into the written word. There was a brief craze years ago, over an optical illusion poster which to the naked eye seemed like nothing more than a jumble of repetitive patterns. What was hidden could only be revealed if the viewer relaxed; both mind and vision had to be present but distant to see the second image. Sometimes the mind rebels at trying to find order in chaos. Even when the latter is represented as a type of order, and within that creating even more confusion, the path to it all along is the simplest yet paradoxically, the hardest to achieve. F.M.R.L. : Footnotes, Mirages, Refrains and Leftovers of Writing Sound by Daniela Cascella (Zero Books) is such an exercise. In some ways, to say it is a book does it a disservice, although of course it takes the physical form. Words in lines, on pages, familiar structures. But there is a magical disorder to all of these which reveals the logic from its listener-writer as well as creating a new one from the reader’s perspective: those of sound and word, meaning and memory. To read, in this instance is to open someone’s mind and play with the thoughts within, and then delve into your own to discover a kinship. …I question language at the edge, dispossessed words against a horizon of void. Words coiled up on themselves, words after sounds that allude to a meaningful absent: troubled, they point at something else but are uneasy with regard to the shape and movement of that at…It’s difficult to operate through them. Either sound is too far and leaves words in a void intimacy, very private but inexplicable and frozen, or it breaks in and leaves no chance. Hence their meaning can only be delirious: not immediate or most obvious. What, how to write in front of sound? But they are also an intricate matryoshka, as shown in her viewing of David Lynch’s Lost Highway. The process of listening here – reclaiming incoherence, as she puts it – nestles other worlds, reversed characters and questions. Questions devour endings, which then transform into beginnings. All is within the matryoshka, just as the ouroboros of myth devours and renews itself. From one movie to another, the mirror scene towards the end of The Lady From Shanghai illustrates this similarly: questions hide answers which disguise the nature of characters – which reflection is the real person, the truth? Sound here is simple dialogue echoing in the mirrored surfaces, bouncing back stark and confusing, a cycle that threatens to be eternal. And then the crystalline shattering of glass, the breaking up of an intricate story of lies, the true characters remaining. I am not transmitting to you a story but just words that live from sound. I’ll keep talking to you and taking the risk of disconnection. …I write because I so deeply want to speak. But she also poses the idea of mise-en-abîme, where the echo is a reassurance, especially as an Italian writing in English, reading French (Leiris’ L’Afrique Fantôme becomes a three year labour of broken understanding and piecing together meaning as she knows very little of the language), where certain words become a reference to other writings, and she hopes that others that reading/listening to her words will understand the echo even if they do not grasp the actual reference. There is a comfort and a familiarity in the shifting nature of words between languages, that transcend, as she puts it, the opacity of listening and writing in a non-native language. Again I go back to that lullaby, it was sung to me by my grand-mother, in Italian nonna, it went nonna nonna nonnarella, it was sung by nonna-nonsense, nonna-sense, and lullaby is ninna- nanna, nonna-nanna, nonna-nenia, nenia is dirge, incantation. Nonna-norna norn. The norns, in Greek mythology, are the spinners of the thread from which life is woven, they measured each person’s lifespan and cut the cord to deliver them into their death, as once they had cut the first cord or chord: when the thread began when sound began. In tune a thread unravels in life, measured by its pace within a recalled lullaby. These memories become sentient soundtracks, chameleons adapting to the colours and sounds of the present. How do we read/understand another person’s soundtrack? We can never really understand it completely, of course – they are like fingerprints. But connections are overlapping Venn diagrams, and the best ones overlap almost to the point of uniting their circles. Her childhood lullaby calls forth my own sung by my Japanese mother, called the Edo lullaby. But what was meant to soothe instead haunted and disturbed while I lay in her arms. This must have been one of my earliest memories, although I do not know how old I could have been at the time. I remember writhing to be released on hearing it, and the look on her face, bewildered, as she put me down. It was a fighting reaction, I suppose, on being told to do something. But it has shadowed me in my life, presenting itself in different pitches in stubborn moments – fighting moments. Nennen korori yo, okorori yo (roughly translated, it means to hush, go to sleep). Nnnn-no, the violent shaking of the head and body when you are young and express your displeasure. Nnnn-Noh: Japanese theatre, character masks. My face/mask looks Japanese, hides my shifting cultural identity that even then was in flux. The author asks, how do you write after sound? To analyse is to destroy its ephemeral nature completely. A plume of smoke, a trail of sound, a memory. They all haunt – how to grasp and solidify but still maintain the essence? In this context, considered words seem to have all the eloquence on paper of an anvil attached to a bird attempting to fly. Sound is the ghost sense. It stands apart from the others. Take the rose, for example. Blood-red, velvet to the touch. A sweet, almost berry scent. And if you chewed a petal, a bitter taste. There may be some variance in this, but not by much. We would all be in relative agreement. But what does a rose sound like? It has no sound, you say. But there would be a sound, however imperceptible, overwhelmed by the rest of nature and ignored by us – this is its ‘nothing’. The sounds of a bud opening, its petals unfolding. How to describe it? To then move from a simple flower to the sound of memory, of history. Is it an impossible task, or is it that we are so used to violently pinning down our descriptions that we cannot yet understand that we can only describe sound as if we were opening our hands to let a butterfly come and rest on them? She speaks of sound lying in-between: objects, words, other sounds. The gap is the place of the tale. Is it that there is a richer, a truer meaning in those spaces? This makes me think of Sappho’s fragments, and strangely, candy floss. The most beautiful of her poetry is the poetry that is not there. The reader translates that emptiness. We hear something in that nothing that speaks to us and spin emotion from it. Clouds of spun sugar are created from sugar and heat, but mainly air. Nothingness is given form. This arises again when the author reads Pierre by Herman Melville, but importantly, an old copy that was misprinted; or rather, not printed at all on several pages. These blank spaces are listened to intently in the context of the words that surround them; what emerges are patterns, while over and over she replays in her head a line from elsewhere in the book: for still hidden writings to read. In the beginning of F.M.R.L., Cascella mentions Bataille on how we should approach primitive art with emotion rather than logical reduction to gain meaning: he urges to consider instead the feeling of their burning, fiery presence that strikes us. Feeling is the temporary release of logic to gain understanding, the complete exposure of oneself to the in-between spaces, the offering of physicality to absorb meaning. It is how we connect with objects, sound, writing, memory, and what gives us the ability to communicate with others about them. It is like the norn’s thread, but eternal, binding us together. 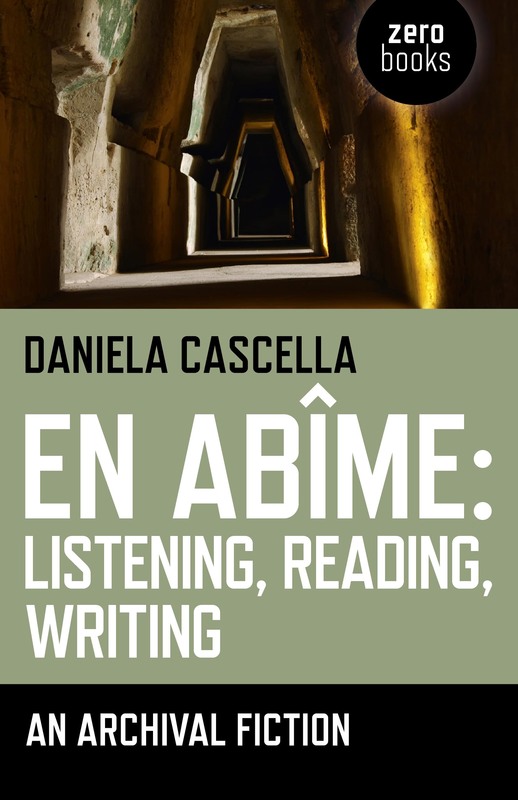 Daniela Cascella, En Abime: Listening, Reading, Writin. An archival fiction, Zero Books, 2012. En Abime explores listening and reading as creative and critical activities driven by memory and return, reshaped into the present. It introduces an idea of aural landscape as a historically defined cultural experience, and contributes with previously unexplored references to the emerging area of listening as artistic practice, adopting an expansive approach across poetry, visual art and literature. "…poetic, incisive, grounded in politics and history yet continually pushing at the edges of what we now consider to be sound. She interrogates notions of music and the shifting experience that is silence with a freshness and coherence that is inspiring"
David Toop, Author of "Ocean of Sound", "Haunted Weather" and "Sinister Resonance"
"… compulsive and fast, rushing with you through textual territories that seem spoken, direct and contemporary while being nostalgic - invoking a past that creates the present tense." Salomé Voegelin, author of "Listening to Noise and Silence: Towards a Philosophy of Sound Art"
ER. Could you give a synopsis of what the book is about; its themes/topics etc. En Abîme explores listening and reading as creative and critical activities driven by memory, reshaped into the present. At the core of the book is an idea of aural landscape as a constantly changing and historically defined cultural experience that I expressed by adopting an expansive approach across poetry, visual art and literature. I devised a three-layered structure through which the book’s narrator revisits, at different points in time, a number of places in Rome – the Protestant Cemetery sung by Pier Paolo Pasolini in The Ashes of Gramsci, via Appia, the Catacombs, among the others – and attaches onto them a series of connections to her recollected archive of poetry, music, literature. The words of Herman Melville’s Roman diaries, Pasolini’s verses and films, a number of other songs and poems build up a mise en abîme; knots of visions and densities of prose are juxtaposed with sparse moments of stillness, as the book zooms in and out of the archival fiction of a city, morphs into criticism and abstraction, and back into a literary landscape [see related blog post]. ER. When did you begin writing it and how did it manifest? DC. I’ve been thinking about this a lot recently: where does the book come from? When I was working in a journalism context, writing features and reviews for magazines I would often write in my notebooks a different version of my articles – at times more fictionalised, at times more playful, or poetic, or abstracted; I was never sure where these texts belonged, and I suppose because the journalistic work was constantly and consistently ‘out there’, for many years I didn’t think that the other writing would ever come to the surface; so there was always an internal – albeit unexpressed – tension in my work, between a very focused (and published) type of writing and another, hidden version. Of course, like in every Romantic tale or book, the hidden double takes over – be it with tricks, or sudden revelations – until it cannot be hidden any longer. I think this book is exactly the place where my ‘other’ writing took over. I also thought a lot about how to write after listening [see related blog post]. How to claim for a writing and reading experience which could have the same authority as the experience of listening? How to determine a ground for writing which would not be seen as ancillary or dependent of the act of listening, but could stand in and of itself and perhaps trigger an opposite movement: from reading to listening? Thoughts on fabulation came along and contributed to the project. And so did the awareness of writing as an act of crossing an edge: simply put, a sheer act of volition, a ‘step into’. I thought of my writing as performing this ‘step into’, and I thought of how the space of writing is built before and after this step: in listening, in spending time listening, in building up a wealth of experience. The idea of ‘having done’ something, having been in a place, the load of experience that shapes you uniquely, all informed this book. ER. It’s not a conventional read by any stretch of the imagination. Can you talk about the structure of the book? DC. The book is actually a mise-en-abîme – a narrative within a narrative within a narrative. There are some more or less hidden tricks that I used in the text to formally structure this mise-en-abîme, but I don’t think it’s necessary to supply a ‘user’s manual’ here: I’d rather have the text unravel in each reader’s experience, than reveal its supporting structure. What I’m keen on saying is, I was interested in employing three different but very close degrees of subjectivities and seeing what happens when you place these slightly different ‘I’s together. The decision to use these layers is also an attempt at placing my words in different degrees of proximity to the moment of listening. It was generated by the awareness that writing and listening can never be one, there will always be something missing, as Robert Walser once wrote. I use the expression ‘unsteady unison’ to talk about this: listening takes you over, in many different ways, and it’s an experience that defines your sense of being, and of being in a place. In recalling the experiences of listening that animated my book, I felt they were so distant and dead, in time, and yet so embodied, present, alive in the space of recalling. So, writing after listening is loaded with a strong feeling of detachment, of separateness, and yet there is this strong sense of ‘having listened’, ‘of ‘having been there’ that weighs upon you – I want to explore this space between the moment I listen and the moment I write [see related blog post]. ER. Did this structure aid the writing of the book? DC. As often is the case in my work, once I’ve found a structure (or a tone, or a shape) the writing moves much quicker. In a few cases in En abîme I deliberately use repetition in the text: the same paragraph, with slight variations, reappears in different chapters to articulate situations that can seem different and then turn out to be actually attached to the same experience. A vague, yet not entirely grasped sense of ‘having been there’ inhabits the pages of the book; I tried to inform the writing with the mixture of distance and embodiment that I’ve just discussed above. ER. Although the book is non-linear it seems heavily researched although not in an academic, question and answer sort of way. DC. When I started writing the book I was very frustrated with reading essays and books characterised by a theory-driven approach to sound and listening, in which the sense of direction was very clear, too clear. I felt the need to experience the territory of listening rather than drawing its map and – to carry on with the territory analogy – instead of just measuring the land and its geological features, the need to consider instead the unknown phenomena and creatures that you encounter, and the weather, the seasons that constantly reshape it. To convey a sense of discovery, not just safety. I also felt the need to introduce other references, and to propose a way of writing sound which is not referred to the writings of theorists but is shaped through the words of writers and poets. At the beginning of all this reasoning is the fact that I approach a subject such as listening in a non-academic way. The book is not theoretical and it is not a survey either: to a certain extent, the actual prompts for this book were not listening, not sound, not art or film, but the act – the pleasure, the struggle – of writing, in and of itself. There was also the need to attempt a writing attached to and shaped by experiences and details and what is peripheral, marginal perhaps, but constitutes listening as much as what is usually distilled and canonised – what is usually left out because it won’t be generalised [see related blog post]. As a writer, the more I thought of sound in theory, the more I found I didn’t have much to tell, or at least I didn’t have any intention to focus on theory in my work. The ‘show, don’t tell’ tactics helped a lot, and so did reading an essay by Flannery O’Connor, The Nature and Aim of Fiction, where she writes of ‘all those concrete details of life that make the actual the mystery of our position on earth’. Listening, like the devil, is in the details! On the other hand I realised that what I could and most of all wanted to say/write was in fact more related to the experiences of listening and all the passing thoughts attached to them, and all the ways you could inhabit a place (in listening, in reading, and then in writing) without necessarily understanding it. To recall that invaluable and transient moment of the encounter with a sound, an image, a string of words, before you can figure them out. And how these stretch and change in time and challenge the habit of listening. All these had to be at the core of my book. ER. And in terms of the books non-linearity? DC. In terms of structure, the book couldn’t be ‘linear’ because while working on it I did not aim at writing how listening and reading function but how they affect you – which is not linear or whole or concluded: you stumble into the past, you enter a reference and suddenly exit it as the sheer sound takes you over, and so on. It’s about being attached to a place through listening (sometimes even when we don’t want to) through different angles and registers, being always there and always removed. I have nothing to conclude, but that’s not because I don’t have anything to say. That’s also why I used the expression ‘archival fiction’ – the book is a function of my archive, and not just a physical archive but what I could call my archives of listening, which are both fact and fiction. ER. You also write in a first person narrative yet as you say constantly blur fact with fiction – why did you write it in this way? DC. At one point in the first part of the book I quote a song whose first verses are ‘I lost all my strength and my ability’: I use this verse as a device throughout the book, voicing the loss of one’s sense of self and only finding it again at the end as a polyphonic ‘I’, after having inhabited different ‘I’s and places. A recurring theme in the book addresses losing one’s voice in the beginning and finding a way of saying something throughout nonetheless: building it through writing, rather than by defining it a priori [see related blog post]. Also I think the more you turn inward, the more you become estranged from yourself and rather than self-absorbing, this process in fact flips over to the outward, which is after all what is so typical of the listening experience. Only yesterday I was reading one of the essays in the catalogue of the Edvard Munch show at Tate Modern, discussing Munch’s obsession with self-portrait, and I was struck by a quote from Sören Kierkegaard referring to a ‘quiet transparency in which the inner reposes in a corresponding outer’. I seek this quiet transparency. ER. Does your nationality have any impact upon the type of autobiography/first person narrative? DC. I’m sure part of my approach to autobiography has to do with the fact that I wrote the book in English, even though my first language is Italian. Writing in the first person in English definitely feels more distant and detached than my Italian ‘I’ – the language I learnt to feel and think and listen in. At the time of writing En abîme I’d only been living in England for a couple of years, so I felt not entirely here or there with language; I really wanted to capture this slippery moment in the use and the shaping of my ‘being in a language’ and listening and writing in it – or, better, on its edges. ER. So would you say the ‘I’ that you use isn’t necessarily a conventional autobiographical ‘I’? DC. Yes, definitely. A lot of the book is fictionalised and I’m still not sure how much of that I want to reveal in my sources: what ‘really’ happened, what I projected, or anticipated, or imagined. Of the places I write about, at least one of them I have never been to – and yet, it doesn’t come across as more or less vividly as the other places I write of. A lot of the book happens on the margins of a half-recalled, half-imagined hazy idea of the city of Rome; when making these decisions, I thought a lot of how E.T.A. Hoffmann never visited Rome and yet he wrote of it in his book Princess Brambilla by looking at Callot’s engravings of Rome: the perfect rendition for his fantastic tale, in between dream and reality, set in the Carnival. However, the songs, poems, films, sounds that I write in the book are very close to me. I suppose the closest to the ‘authentic I’ is in my sources and in my experience of them, in my being with them at different times – ultimately you can find me in the bibliography, discography, and in the act of writing: in what the writing went through and how it was sifted by my listening and reading experiences. In The Predicament of Culture by James Clifford there’s a chapter entitled ‘Ethnographic Self-Fashioning’ that I’ve read so many times throughout the years, and that helped me a lot in thinking about where I place my writing. I like to think of En abîme not as autobiography but as self-ethnography. There’s a ‘graphein’, a writing element that I’m really attracted to, how the self is shaped in writing. Clifford also shows how Joseph Conrad’s self is fashioned out of a ‘not being in a language entirely’: this happens in bi-lingual writing. It makes you ask these types of questions: where is the self? ER. Could you have written this in Italian? DC. I don’t think so. As I said before, the book was born out of the need to write in a state of removal, of fluctuation, so it was crucial to use a language I’m fluent in, but not quite so comfortable in. I needed to retain a certain hesitation in my tone, to embody the unsteady unison in my words. A little anecdote here: I recently wrote something in Italian, and I ended up grasping for words! When I started to get back into my first language, I really got a sense of the artifice and the construction of the ‘I’ in my native tongue [see related blog post]. ER. This makes sense when thinking of the ‘Archival Fiction’ tag within the title. Which category will the work reside in when it’s on the bookstore shelf? DC. En abîme can be found in the ‘literary criticism’ category, which I’m quite happy about. But this was one of the issues when I started to look for a publisher: which discipline does this book belong to? Apparently it didn’t fit into the ‘music’ or ‘sound studies’ categories. The moment I saw its form – a novella, a long-form story – rather than the discipline it belongs to, I understood a better way of presenting it. DC. There are already many voices in the book and I just didn’t want to have another layer, particularly one that would be explanatory. I don’t think the book needs that type of support and framing; the bibliography reveals that side of things enough. It’s the same with the omission of footnotes. I just wanted it to be experienced as a piece of writing in itself, with all the references and notes at the end for anyone who wants to find my sources and details of my quotes. This is the reason why I really like Salomé Voegelin’s foreword: it does not explain my text, it resonates with it. ER. How do you begin/structure your writing in general. DC. Initially when I write I know little of where I’m going. I can’t see from A to B in my drafts, I don’t see a trajectory, rather a series of visions (Joan Didion called them ‘shimmering images’) and rhythms that need to cohabit, at times even in spite of themselves and of what might be predictable. So I work with clusters of words and thoughts, gradually adding on to them. I have a strong feeling of where I am, but not where I will go. It’s a constant process of self-motivation, to stay close to these clusters as they appear, and to trust them. I never set out saying ‘I want to prove this or channel that’, writing for me is about responding to something else, something coming from outside – be it a sound I hear or a book I read – rather than being generated by me deliberately and out of the blue saying ‘today I’m going to write about that’. I’d say my writing process is not speculative, but experiential. So when all these clusters have taken space, and expanded, then I think the really hard and excruciatingly enjoyable work begins: editing, arranging words, leaving out (a lot), working with forms. In fact researching a book works for me in two parallel ways, not only researching a topic, but also researching a form, a language and its structures. ER. Where do you think this attention to shape comes from? DC. I think it’s got to do with writing it in English – not only did this choice place me, as I said before, in a terrain vague: it also allowed me to see the form and the sound of language in a more exaggerated manner. Those moments of transition where I used very long sentences, typical of Italian language, yet employing English words: or, the repeated use of Latin, for example, which in Italian is a lot more common than it is in English. I sought to render these moments of transition. I also think that the attention to form comes from the very way my writing language has been shaped throughout the years – since I was a teenager I was immersed in fiction, and what really shaped my thinking and what formed my language is undoubtedly literature and poetry. In writing a short book I also hoped that the form could be experienced in its totality more clearly than if it had been a longer text. ‘To be read in one sitting’, to quote Poe. To go back to your question on form: I have an attraction to surfaces, a soft spot for the shape and the look and the sound of things, my first response when I read a book or listen to a record or look at a painting or watch a film, is always about their texture, only later I become concerned with what they might be ‘about’ as a deliberate way of thinking, because ultimately what they are ‘about’ resides in what they sound like, what they look like or move, and so on. I just don’t trust casual forms or shabbiness. I suppose that’s why Pasolini appears so often in my book [see related blog post]. ER. Is there a book which opened up this way of writing for you? DC. A very early influence. Earlier this year I read again Proust’s In Search of Lost Time and I realised I’ve been returning to this book once every decade! So, apart from obviously having laid the grounds for a project of ‘comparative reading’ when I’m in my seventies, I have this sense of being physically affected by this book. I remember spending summers as a teenager reading it and being engrossed, not trying to understand, just experiencing it. When I re-read it this year things fell into place, and I realised it had been with me all these years, although I didn’t rationally know it. In terms of more recent works, the list can be too long, but in general I’m always inspired by the work of writers and artists who are not easily canonised, who liberate their form instead of being caught in it, who don’t care about being prescriptive, who play freely with their past. Some of them also appear in my book: the Italian writers Giorgio Manganelli, Carlo Emilio Gadda, Cesare Pavese; Herman Melville who is still so much of an enigma; Steve Roden; David Toop; the Italian performer Chiara Guidi; musicians such as Mike Cooper and Mika Vainio; in a very diagonal yet very meaningful way, Michel Leiris. ER. What is the relationship between listening and reading for you? DC. Listening and reading seem to occupy a fairly similar starting point for me. I don’t think I’ve ever experienced a pure listening moment without it being reflected in my reading, but again that’s just part of how I work. The books I read inform the way I listen – and feel and think. And that’s basically how this book took shape. I was thinking about how certain places and landscapes would always reappear in my attempts to write about sound, and my thoughts would always return to certain places. At some point in the book I quote a sentence by Antonio Gramsci that has always meant a lot to me: he wrote in his Prison Notebooks about ‘the organic adherence by which feeling-passion becomes understanding, therefore knowledge’. These words have always been for me as foremost keys into listening. To listen is to grasp a deeper sense of place, of self, of stories. In Italian the verb comprendere, to understand comes from Latin and means to embrace. It is expansive, not normative. It embraces diversity. Sapere, to know, comes instead from a verb that means to have a taste of, to catch a flavour. And sentire in Italian means both to feel and to listen. Gramsci’s claim for ‘a shift from knowing to understanding, to feeling, and back, from feeling to understanding, to knowing’ encompasses the expanding function of listening: from having a taste of something to embracing it – ultimately, to knowing it. ER. It’s clearly a very creative, artistic work – where do you position yourself as an artist, researcher or writer? DC. At the beginning I thought I would write a book on ‘sound’ – I say ‘I thought I would’ because the idea was very blurred, certainly more an expectation, some sort of cause/effect silly reasoning than a real interest for me – something like: ‘OK you have curated sound-related projects for all these years and have written on sound, now why not collect it all in a book?’ sort of vague and predictable trajectory. I wasn’t satisfied, it was as if I was playing a part that did not belong to me. I just couldn’t think of ‘sound’ on abstract terms, or grasp it as a topic, as if it was a category. So I began looking backward to what had really animated my experiences of listening, what had drawn me to researching sound more and more? It was a sense and the shape of ‘being there’ before any recognition or awareness, that had nailed me to a number of listening experiences, and in turn these were always contaminated and impure: I couldn’t even start considering writing them in and of themselves, as if under a glass case. I realised my writing sound had to reflect the way I’d always experienced it: on different registers and languages and matters. My first degree was in Art History, I worked as a music journalist for many years, and even before all this I grew up reading fiction… Why did I have to ignore all this? I really began enjoying writing En abîme when I realised the book could embrace all of it. I ended up going into visual arts territories and into Italian traditions and history – I really couldn’t entangle them and deny they were part of my hearing. ER. Do you ever write in situ, in the places you write about in the book? DC. Most of the book was generated by displacement – written about elsewhere. I write in situ very rarely and when I do, it’s mostly to catch the rhythm of a sentence that occurs in my mind and how words are stitched together. It’s important to say that for me this book is not a nostalgic longing for an ‘original’ or uncontaminated place or time. In fact it’s the opposite, it’s got to do with ‘re-visiting forward’, and with writing this re-visiting in a different manner every time. ER. How does your blog function for you – is it to generate ideas? DC. It started because I had all these research notes and wasn’t sure what to do with them, also I wanted to somehow add another layer to the project. More recently I have been posting reviews and other texts not strictly related to the book but informed by the same approach. It’s a place where I can have all these different voices and hopefully give a sense of what I’m doing on different registers. The blog is great because I can experiment more, not be constrained by deadlines, use fragments (a form that I’m researching a lot at the moment) as well as longer texts which are not published elsewhere. Much like what I used to do with writing alternative reviews in my notebooks. It’s good that it’s there for readers – and it’s been helpful for others to find the writing. Things are also more immediate there and they have a sense of being more than a note in a book. ER. What are you writing next; do you have another archival fiction on the way? DC. At the moment I’m developing two new projects, both of them at very early stages so I won’t talk too much about either. The former is a collection of fragments and longer texts on lesser known or published writers and artists – whose work is too peripheral and certainly not ‘of the moment’, even insular in certain cases. It might end up being the first book I write that is not strictly related to ‘sound’ (although I like to think of it as a voicing). The latter book is a satire. DC. Oh, the very awkward moment I feared! It’s odd, isn’t it, this whole ‘sound art’ ghost and how some artists seem haunted by it to the point of denying it. The ghost cannot be ignored though, as annoying and nerve-wracking as it might be. Maybe we could just be like mediums: channelling the ghost although not always understanding the sense of its presence; and the space of listening won’t always coincide with the space of explaining; and sometimes this resounding ghostly space can be a bit of a con, or a mock-up, and other times it can speak straight to you and nail you to what is meaningful. To go back to your question: I like to think of sound art as a non-canonised way of shaping listening – wandering around and being surprised. The less you can grasp it in a definition, the more I’m attracted to it: at its most self-effacing. Working in ‘sound art’ always meant for me the freedom to be in a field that, not being defined, allowed me to play with and ponder on thoughts and words which wouldn’t be able to exist together otherwise. The relation between sound art and the attempt to define it is like the relation in geometry between a curve and its asymptote line: they do not fall together. The former tends to touch the latter ad infinitum. And the curve will never be straight. I think sound art is a way of being elsewhere, and never quite straight. My blog on Writing Sound. Short text in Viso come territorio / Face as Territory exhibition catalogue. Edited by Maria Fusco and Richard Birkett. 'A major new publication shifting Cosey Fanni Tutti from noun to verb. This new book is the first major publication discussing and theorising Cosey as methodology'. Contributors include: Martin Bax, Gerard Byrne, Daniela Cascella, Lili Reynaud-Dewar, Diedrich Diederichsen, Graham Duff, Anthony Elms, Chris Kraus, Patricia MacCormack, Clunie Reid, Rob Stone, Corin Sworn and Cosey Fanni Tutti. Designed by Zak Kyes. Text for Leif Elggren's 'The Sudarium of St. Veronica'. Text on Steve Roden, published on the occasion of his London residency, 26-30 March 2011.